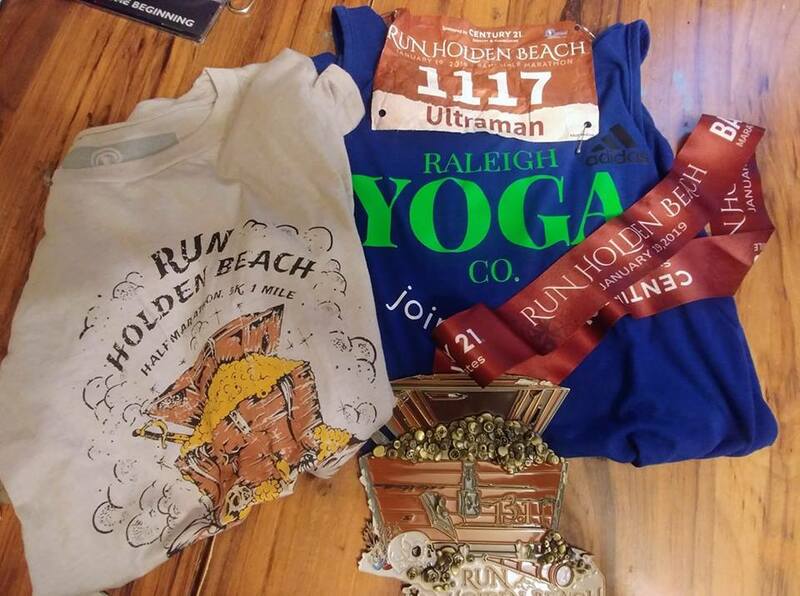 runjoey: Run Holden Beach Half Marathon. My training has gone ok but it's been hampered by a cold that lingered for about 5 weeks. It never was really bad but affected my breathing and I'd start coughing sometimes in a run and almost always afterwards. But finally that seemed to have cleared up over the past few days. As race day approached things started to look good and falling into place and the weather forecast of mid 40's to low 50's was nearly perfect. As I made my way to the 7am start, the sun was just beginning to rise. I only did a short half mile warm up in the dark. I lined up with a goal of just getting under 1:49 which we be my fastest since last March but I wasn't all that confident. The race started right on time and after less than a quarter of a mile we began to climb the bridge which is tough without much of a warm up. 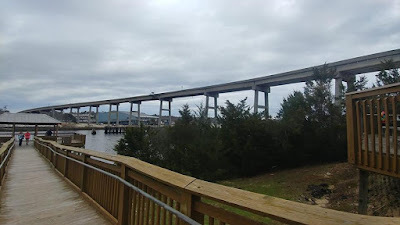 The bridge like every new one built over the Intracoastal Waterway is a minimum clearance of 65 feet and this one is probably the steepest one of them due to the topography only allowing for a short ramp. And it would probably have been impossible to even squeeze it in so rather than straight over like all the others, it is built with a couple of S curves but it's still steeper than cemetary in Umstead. So, anyway, I backed off the pace not wanting to go into oxygen debt in the first half mile and enjoyed the view ! Cruised down the backside and before too long hit the first mile in 8:14. Not bad since my overall goal pace was around 8:15-8:18. The next few miles were on the mainland and about pancake flat. Mile 2 was 8:00. By now I was feeling good and that felt fairly easy and was a good confidence boost. Mile 3 was at the first turnaround and it was 8:05. At this point I could see everyone ahead of me and I figured I was in the top 50. I saw one guy that looked like he could possibly be in his 60's in the top 20. If he was 60 then no way I'd be winning today. Mile 4 was 8:19 and I was cruising and happy. Mile 5 was almost at the top of the bridge as we made our way back over to the island. I was actually surprised at not having a struggle and almost holding pace in 8:22. It was still too early to think about trying to push the pace but I did try to get a little momentum going off the bridge. Mile 6 felt almost easy and was my fastest in 7:55. Wow, I may beat that 1:47:? I ran in Tennessee last March ! Mile 7 was another 8:00. This was awesome. And then as we made the turnaround to head back to the opposite end of the island I realized why the last two had seemed so easy. It seems the wind had picked up and was now blowing a steady 10mph or so. Not all that bad but you could definitely tell a difference in the effort. Mile 8 was 8:11, still faster than goal pace. Mile 9 was 8:16, still good but I could tell I was wearing down a little while I mentally convinced myself I just had an easy 4 miler to go. Mile 10 included maybe 4/10ths of a mile on a dirt/sand road. It was pretty hard packed so not really much of an issue but it combined with a 3rd mile in a row into the wind and I had my slowest mile of the day in 8:35. Ok now, just a 5K to go ! You can push that home ! Goal is still in the bag ! Between mile 10.5 and 11.5 we had several little rolling hills over some dunes(on asphalt at least!). Nothing long or steep but I was feeling them and to be honest when I went through mile 11 in 8:24 I had expected slower. Now I was really working the mental math. I still felt like I had the goal but the cushion was disappearing. Mile 12 came in 8:31. Not good but I felt I had enough in me to push it home and as long as I stayed under 8:30 it was all good. The finish line is directly under the bridge and it sure looked an awful long ways to it but after a short little in and out and u-turn in a neighborhood I could see the mile 13 banner ahead. That one was 8:24. A right hand turn and there it was. BAM ! 1:48:51. Mission Accomplished. I was soaking wet with sweat due to high humidity and effort despite the cool 53F at the finish and the breeze so I immediately begin walking to my car to get warm and changed into dry clothes. I checked online but no results had been posted so when I went back for awards I had no idea how I'd placed. As I suspected it turned out that guy that was so far ahead was 64 and ran an amazing 1:36:36 and came in 15th place overall ! I was 2nd by about 3 minutes and 49th of 381 finishers. This race is part of a series of Beach runs by Coastal Race Productions. This was only my 2nd time running one of their events but they are really quality races. I paid 56:25 including fees which is very reasonable with most halfs going for 70 to 100 dollars these days. For that you get a certified course, timely starts, plenty of aid stations and porta potties. ( I got lucky and found an indoor bathroom open with no line :). Good water stops, and food and beverage at the finish and the Biggest medals out there if you like medals. I'm also signed up for Sunset Beach half on March 30th so come join me as I try to knock a couple of minutes of my time. Good race report and great effort out there. thank you. It's not getting easier !